Choosing a baby formula can be a difficult decision. But finding the best formula for your little one doesn't have to be complicated. 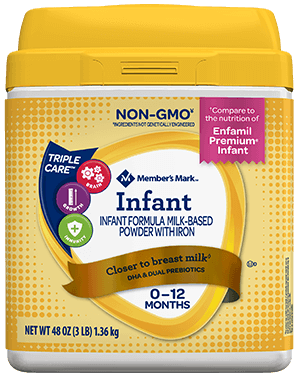 All infant formulas sold in the United States meet the same U.S. Food and Drug Administration (FDA) requirements. In fact, the FDA regulates the amount of every nutrient in all infant formulas. 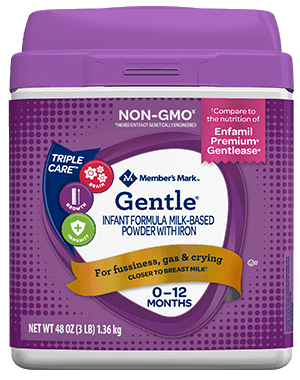 That's why you can be certain all infant formulas, regardless of branding and marketing hype, provide a complete, sole source of nutrition for your baby. Even though 66 percent of the pediatricians surveyed admitted "What formula do you recommend?" ranks highest among feeding questions, and 59 percent of pediatricians distribute free formula samples in their offices, the majority say they're not recommending that brand specifically and are simply giving samples to moms because they have them to give away. We take into account that every mom's journey with her child is unique. 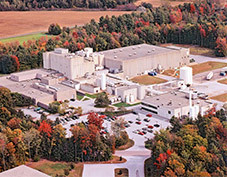 Our philosophy is to support you no matter what your decision is when it comes to infant formula. We are here to provide you with the right information and support no matter what type of infant feeding decision you make. We recognize and agree that breast feeding is recommended by healthcare professionals and know that infant formula is the only safe alternative supported by the medical community. 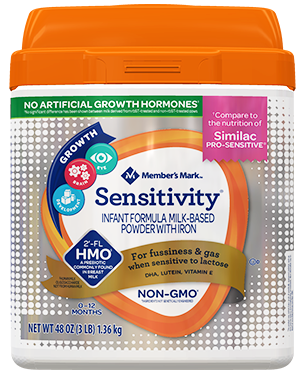 We want to provide you with numerous options – from Member's Mark Infant and Advantage® 1, to low lactose formula varieties: Sensitivity® and the partially hydrolyzed formula Gentle®. There are different types of formula on the market today, and it can get confusing. In the end, there's no one size fits all approach. There's no magic formula. Breastfeeding or choosing a baby formula is up to you, mom, and to a certain extent, your pediatrician, to decide what's best for you and your baby. We make the most important products for the most important customers. 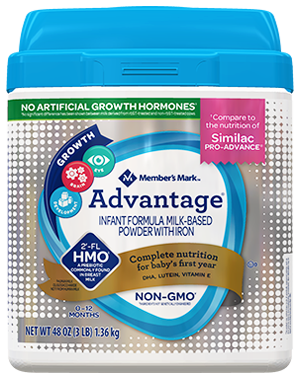 Sam's Club members can be certain their Member's Mark formula brand offers high quality infant nutrition at an affordable price. *Data was collected from a nationwide survey of 251 pediatricians in August 2014. The survey was conducted via SERMO, the largest online physician community. **Based on October 2017 price study of Member's Mark® vs comparable formulas. See label for full disclaimer.